Welcome to the Citroën ConnectedCAM™, a connected camera developed by Citroën to enhance your driving experience, freedom of mind and, naturally, your safety! The Citroën ConnectedCAM™ is an HD camera that records your best road trips in complete safety. With a single click, take a photo or record a 20-second video and share it with all your friends directly on the social networks. Citroën ConnectedCAM™, an exclusive Citroën technology available on the New C3. Located just behind the interior rearview mirror, the Citroën ConnectedCAM™ records the highlights of your trips in 120° wide-angle full HD with 2 million pixels. A crazy scene in a traffic jam, a panorama from a mountain road or a drive through a picturesque village? Capture it and share it! • Take a photo by simply pressing on the Citroën ConnectedCAM™ button. • Record a 20-second video with a long press on the Citroën ConnectedCAM™ button. ... And obviously you can turn the camera off whenever you like. For more seamlessness and user-friendliness, the Citroën ConnectedCAM™ is accompanied by a mobile app. 2) Connect to the Citroën ConnectedCAM™ with WiFi. 3) Set your publication preferences. 4) Capture your best moments in photo or video. 5) Share them with your friends on the social networks of your choice. 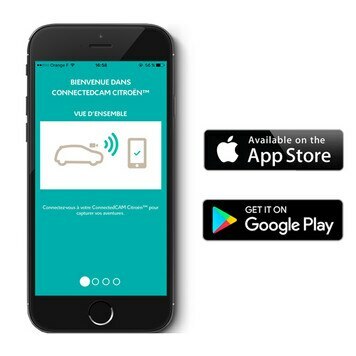 * The Citroën ConnectedCAM™ app is compatible with iOs (9 and later) and Android (5.0 and later). In the event of impact, the record function is activated automatically to save a 90-second sequence (30 seconds before and 60 seconds after the impact) and bring you more safety and guarantees in any procedures with insurance companies. Also, finding your parked car is easier now thanks to the Citroën ConnectedCAM™ app's geolocation function.